set in its own private lawned garden with far reaching views of the mountains and surrounding countryside. Stylish & comfortably furnished to a high standard with quality bed linens & towels provided. Peaceful rural location but within walking distance of 2 kms to Vernet la Varenne which has a variety of village shops, bar & restaurant. Is open lunchtime and evening during the summer is only 1.5kms away. Le Mouy Vieux is set in a peaceful location on a gently sloping, south-facing hillside in the Livradois Forez national park.
' un panorama de rêve,' a panorama of dreams as quoted of the region by renowned french writer and anthropologist Henri Pourrat 1887-1959 and who lived here in Vernet la Varenne. We are only 2kms from the village with restaurant, bar, and shops for your everyday needs. 15 kms from the main A75 auto route at Issoire and 30 minutes south of the cathedral city of Clermont-Ferrand. Maison Marguerite sleeps 2-5 has a spacious family sized main bedroom with vaulted ceiling a comfortable double bed, 2 antique lit bateau one of which doubles up as a comfy sofa. Large wood burning fireplace and central heating. French doors open on to a small private terrace ideal for morning coffe in the sun whilst planning the day ahead. Open plan sitting room with comfortable sofas,cosy throws chair & footstool, Flat screen satellite TV, DVD player,CD,iPod dock, games,books and DVD's. Stairs leading to the twin bed annexe ideal for your family or friends (not suitable for small children or the elderly) also shares bathroom facilities with maison Marguerite. My other gîte Maison Blanche is a detached stone cottage beautifully converted and ideal for couples looking for a romantic retreat or friends and family who want to holiday close by but still retain privacy if needed. Large double & comfortable four poster bed. Le Mouy vieux is situated 2kms to the west of the small village of Le Vernet la Varenne. Here you will find a weekly market, good butchers, small supermarket, pharmacy, tabac, bar & artisan boulangerie where you can buy delicious croissants. The popular local swimming lake has a small beach and an area for fishing. The village & local chateau organise many events throughout the summer. A beautiful, peaceful rural retreat for your French holiday base; an ideal place to relax, or explore the old hilltop villages, historic towns & romanesque churches nearby. Le Mouy Vieux is perfectly located for those who are a bit more serious about their cycling holidays. Whether you prefer off-road or are even a budding, or aspiring, Tour de France rider (Le Tour has passed through here twice in the last few years); cycling here is a real treat. Experience for yourself the well-kept, smooth roads that wind their way into the forests and mountains of the Livradois and the flat-plains in the valleys between the Puy's. The Volcans national parc and the ski resorts of Sancy & Super Besse are within a 45 minute drive passing through stunning scenery, so the area is ideal for summer & winter holidays. Fell in love with the views from the garden over the valleys to the distant mountains of the Cantal. From the top of the quiet lane leading down to the property you can see the magnificent Puy de dôme and range of volcanos. Beautiful setting quiet and peaceful location but close to village with all amenities. Not too far off the beaten track 15 minutes from autoroute. Twin sink vanity unit Bath with shower Separate toilet. Quality towels Bath sheet Bath towel Hand towel Flannel provided for each guest and changed weekly or on request. Amazing setting the house is beautifully decorated and all us 4 enjoyed our stay. Very well equiped. Garden and facilities to the top. Our host was amazing too. The property is exceptionally well furnished, well equipped and clean. The garden is very well kept and an ideal place to spend lazing. Vernet la Varenne has good local shops and there is a supermarket and large farm shop within easy reach at Issoire. The surrounding countryside is beautiful and offers many places for excursions. Lynne, the owner is very pleasant and attentive without being intrusive. again on your second holiday here at Le mouy vieux and look forward to your next visit. Everything you would want in a holiday rental. Away from it all at 2500 feet but good facilities a short drive or 20 minute walk. Lovely host who was not intrusive but available. Wildlife watching from the garden a delight and great access to all the local attractions. Our second visit and will be looking to return again, property offered everything we required and our host Lynne with her local knowledge and hospitality made it the most perfect holiday. Area is outstandingly beautiful and we found new places that became favourites and revisited some to enjoy again and explore a little more. Thank you Lynne for allowing us to share your little bit of heaven. Thank you so much for your great review, it was lovely to see you all again and to know you enjoyed another holiday here in maison marguerite. We look forward to you coming back soon. Maison Marguerite lived up to all our expectations & then some! Lynne was a wonderful host & made us feel very welcome. The accommodation was first class - well equipped, very spacious & comfortable - especially the outside terrace because we had such lovely weather for the majority of our stay. ideally situated to explore the beautiful Auvergne region as this was our first visit to this unspoilt area. Highly recommended. Mandy & Andrew, Otley. Thank you so much Mandy and Andrew for such a great review it's so rewarding for me to hear you enjoyed your stay in maison marguerite, you were my perfect guests. France is our favourite holiday destination, so this year we decided to visit the Puy de Dome region. After searching Home and Away we found a beautiful gite in Vernet la Varenne. Upon making contact with the owner (Lynne) I knew that this gite would meet or even surpass my expectations, and I was not disappointed. Before departing for our journey Lynne supplied all the necessary details of the gite and full directions. 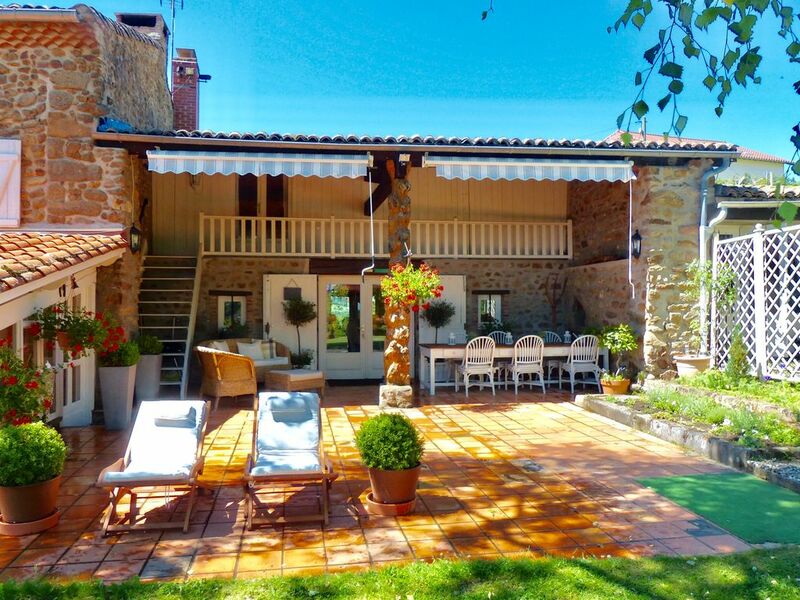 This gite is furnished to a very high standard, and all you require for your stay is to hand. The area around the gite is very beautiful and you have very lovely views of woods and the mountains. It snowed during our stay and this made the views even more delightful. The hospitality showed by Lynne was perfect, we were given full privacy, but when we asked questions she was willing to share her knowledge, experience and tips of the region. We do hope that in the near future we can visit Lynne again and stay in this wonderful gite. Thank you. Thank you Rita & Andre for such a great review, so happy you enjoyed your stay we really enjoyed getting to know you and hope to see you here again.